This information is shared by Mr. Vinod Viplav. He can be contacted on mobile – 09868793203 or Email – screenindia@gmail.com. Following article was published in the prominent English Daily “The Hindu” on November 1, 2008. This article is written by Mr. Souvik Chatterji. 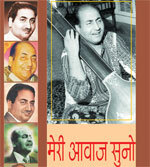 You are currently browsing the Rafians tribute to a true Maestro – Mohd Rafi weblog archives for November, 2008 .